This is a real expedition across Sardinia through 4000 years of history, 400 km of adventure under the bluest sky you've ever seen and into the clearest sea in which you've swam. This is an exciting ride from the ancient Catalan walls of Alghero to the Malvasia vineyards, from delicious Montiferru foods to the Roman “Thermae” of Fordongianus, from the mountain forests of Barbagia to the megalithic Nuraghe Arrubiu in Orroli, from the white beaches of Villasimius to the lively streets in the port of Cagliari. 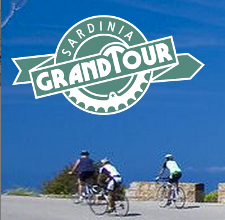 Treat yourself to an unforgettable adventure, come to discover Sardinia by bike. I really love your blog.. Great colors & theme. Did you develop this web site yourself? Please reply back as I'm planning to create my own personal blog and would love to find out where you got this from or exactly what the theme is named. Cheers! Hello There. I discovered your weblog the usage of msn. This is a very well written article. I will make sure to bookmark it and come back to learn more of your helpful info. Thanks for the post. I'll definitely return. Excellent blog you have here but I was wondering if you knew of any user discussion forums that cover the same topics discussed in this article? I'd really love to be a part of online community where I can get suggestions from other experienced people that share the same interest. If you have any suggestions, please let me know. Thanks a lot! Hello, i feel that i noticed you visited my website so i got here to return the favor?.I'm trying to find things to improve my website!I guess its ok to use a few of your ideas!! I blog often and I really thank you for your content. The article has truly peaked my interest. I'm going to book mark your blog and keep checking for new information about once a week. I subscribed to your RSS feed too. I like the helpful info you supply on your articles. I will bookmark your weblog and check again right here regularly. I'm relatively certain I'll be told many new stuff right here! Good luck for the next! A person essentially help to make severely posts I'd state. That is the very first time I frequented your web page and so far? I surprised with the research you made to create this particular submit extraordinary. Magnificent process! PureFit Keto starting the day with eggs. The reduced calorie consumption wasn’t just visible through to lunch, but up to thirty-six hours later. This means that starting the day with eggs can help you eat PureFit Keto fewer calories throughout the day. A second study found that when combined with a calorie-deficit, an egg breakfast can lead to 65% more weight loss, and 16% greater reduction in body fat percentage. We recommend breakfast such as this Mediterranean Egg White Frittata and these Individual Spinach & Egg Bowls. 2. Reduce the amount of oil you use when cooking.